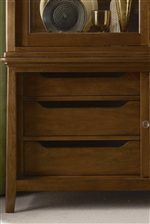 The Cherry Park Single Dresser is just the multi-purpose storage piece you've been looking for. 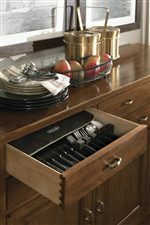 The six drawers with champagne metal hardware are great for keeping any room organized. 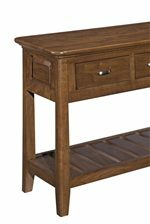 The two component openings provide a place to display objects or house any accompanying electronic devices, as this dresser can also function as a media unit. The cord exits make the Single Dresser wire management ready. 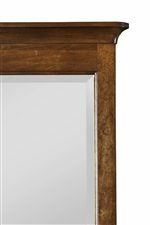 The Cherry Park Media Ready Single Dresser by Kincaid Furniture at AHFA in the area. Product availability may vary. Contact us for the most current availability on this product.